Anthony Shoesmith broke the club’s try-scoring record for a season as Old Rishworthians signed off from Yorkshire Two with a 43-8 home win over Wath Upon Dearne yesterday. The winger scored three of his side’s seven tries at sunny Copley, taking his tally to 30 in the promotion-winning campaign. The conditions were in contrast to Wath in September, when Rishworthians lost 7-3 with a much-weakened side in the pouring rain. The first half started with the Wath forwards building phases and using their heavy mobile forwards to run at the home team. The Rishworthian scrums were solid and after five minutes Josh Kelly made a break and passed to Sam Nunn, who created a try for Jacob Ford at scrum half. Kelly missed the conversion. The large crowd did not have long to wait before the second try was scored. Ford burst through the Wath defence and the supporting Kelly passed to Shoesmith for his first. Kelly was successful with the conversion. With the score at 12-0 and Luke Flanagan narrowly missing out on a try in the corner, the home side appeared to be in control. However, Wath were winning the line outs and Rishworthians were being heavily penalised. Play continued near the home try line but the defence, marshalled by James Clarke and Anthony Nathaniel, prevented Wath from scoring. In the second half Wath came out like a different team and created chance after chance. The home defence prevented the visitors’ back row from gaining ground but Sean Power kicked a penalty. Clarke won the ball from the kick off and set off on a typical run with the Wath players unable to stop him. Five metres from the line the ball was popped up to Shoesmith, who dived over, and Kelly converted. The bonus point try was scored by Taniela Bakoso who crossed following a break by Shoesmith. The home forwards were beginning to dominate and Shoesmith received the ball on the halfway line and his pace beat the defenders for an unconverted try. Jack Davis, fresh from a tour to South Africa with Silcoates School, received the ball in the home 22 and drew a defender before passing to Nunn, who scored a wonderful try converted by Kelly. From the kick Bakoso weaved his way through a tired defence. The conversion was kicked by Kelly. 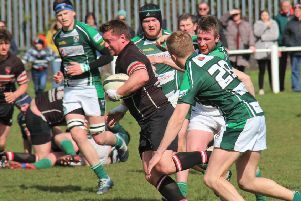 Wath had not finished and scored a try just before the final whistle, which was unconverted. The development XV were beaten 29-17 by Heath in the Aire Wharfe West play off final at Ilkley. The return to rugby team played its sixth game of the season, defeating Cleckheaton thirds 51-17. Tries were scored by Wright (3), Puddephatt (3), Gill, Soothill and Ashton, with Luke Durrant converting three.